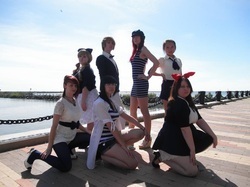 Abracadabra Productions is an anime, K-Pop, and J-Pop dance and cosplay cover group from the Cleveland area. The dance troupe has premiered at Colossalcon, Glass City Con, Ikasucon, Matsuricon, Kitsune Con and Shinbokucon. Bringing their dance routines to local conventions since 2011, their mission is to entertain the growing anime and K/J-music world and enrich today's convention scene.